First thing you want to know is, Are they real, or are they fake? I'm talking about hybrid electric cars, of course! ...when Detroit heard the public wanted greener vehicles like hybrids and electric cars, they answered, "Sure, we can do that!" And then they simply dropped in an extra battery to run the accessories, turned off the engine at stoplights, and stamped "hybrid" on the chassis. Voila! The same old gas-guzzler in a "green" dress. Automakers have mostly given up that deceptive practice today - we're on to them! - but let's talk about what makes a hybrid "real" (significantly increased gas mileage, lower emissions) vs. "fake", I'll show you some examples of each, and we'll figure out together how NOT to get fooled. 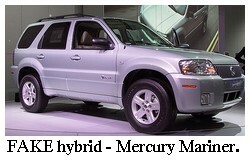 In the series hybrid, the electric motor makes the wheels go 'round. There is a battery, and there is a gas engine; the gas engine is used as a generator to provide electricity to recharge the battery (which makes the electric motor run, which makes the wheels go 'round). This is ALL the ICE (Internal Combustion Engine) does. The rest is electric. Since it's all about the electricity, you can imagine that regenerative braking figures heavily in this car's design, and that it's the closest thing to an electric car (with range-extending options) that exists without, you know, actually being an electric car. 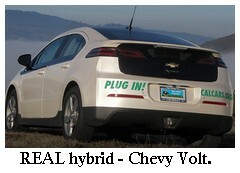 The Chevy Volt is a series hybrid, for example. These hybrids are good for in-town, stop-and-go driving, just like an (all) electric car. The range extension they offer provides a nice added attraction for longer trips, or the anxiety prone. The automakers didn't offer this type in the past, as you know, but with the success of the Volt they're coming around. Now they are absolutely everywhere! Usually, parallel hybrids are the fake kind of hybrid. Not always. 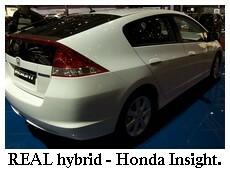 The Honda hybrids like the Insight are parallel hybrids, and they're definitely NOT fake. 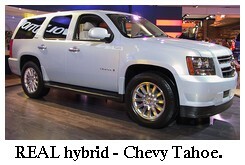 In the parallel hybrid, the electric motor AND the gas engine make the wheels go 'round. The gas engine can either move the wheels or provide electricity to the battery. 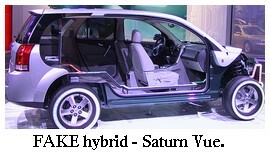 These hybrid electric cars, according to this Wikipedia article on hybrid drivetrains, are the most common type of hybrid in production today. What characterizes the parallel hybrid system? The computer shuts off the ICE at stop-lights to save gas. (This is not a bad feature. However, a little "issue" here is that, because the oil takes a bit to get warmed up and flowing freely throughout, all this starting and stopping is not so good for gas engines. Good for the environment, though, in the form of reduced carbon emissions, so it's hard to argue with that. I might add that it also happens to be pretty good for the carmakers, who'll be glad to sell you another car when the engine wears out. The Karma Revero is a plug-in parallel hybrid, too. So where does the "faking" come in? Power-assist hybrids are generally fake. They don't have to be, but they usually are. Some of these - like the 2006 Mercury Mariner for one - only use the electric motor to provide extra torque in high-demand situations. 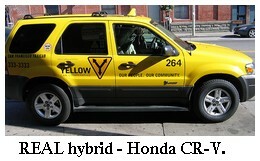 They are still "hybrids", technically, but are not designed to ever move the wheels using electricity alone. ...and either the electric motor OR the gas engine could be dominant (while still being called "hybrid electric cars"), the automakers discovered that they could neatly disguise the same old gas-gulper as a hybrid electric car. The drive is controlled by computer, and just because the electric motor CAN move the wheels doesn't mean it HAS to! The manufacturer could deliver a hybrid that performs almost exactly like it's gas-gobbler brothers, and delivers about the same gas mileage, too. Sigh. Combination series/parallel hybrid: aka "synergy drive"
A hybrid hybrid, you ask? Exactly. Toyota figured out that if you've got to use a computer anyway, you might as well make things more efficient for running on the freeway AND running in town - so they came up with "hybrid synergy drive" that the Prius made famous. The combination series/parallel hybrid uses a smaller gas engine than its gas-burning counterpart would typically use, because the gas-burner needs most of its muscle to get from 0-35mph...so if you don't want your ICE-mobile to be a SLUG (and who does?) then you've gotta have a fairly big engine. It uses its electric car personality in town and on the low-gear acceleration, where electricity RULES - and then when you get up and going, a smaller gas-sipping engine kicks in to take you down the freeway. The computer control makes this switch flawless, as any happily addicted Prius driver will tell you. Even the non-plug Priuses were REAL, of course...but the plug-in version is even better. Have you read the story of how the first plug in priuses were converted in the US by adding batteries and activating a button? An interview with Netgain about their EMIS hybrid electric conversion kit for light trucks and vans. 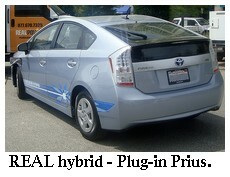 Andrew Bell's plug in Prius conversion story. Alain St. Yves hybrid S-10 conversion using a portable generator.